Heart disease is the leading cause of death in those aged 65 and older. This translates into an estimated 38 million Americans diagnosed with some type of cardiovascular disease, according to the American Heart Association (AHA). Of these, approximately 8.5 million will suffer a heart attack. The average annual rate of a first heart attack rises from three per 1,000 for 35- to 44-year-olds to 74 per 1,000 for those aged 84 to 95. Among Americans of all ages, it’s estimated that in 2010, some 785,000 will suffer a first heart attack and approximately 470,000 will have a recurrent attack, according to the AHA. The two blood fats that make up cholesterol can be potent indicators of heart attack risk and reoccurrence. 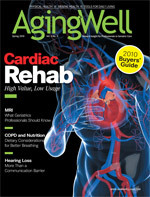 For example, a study of 89 patients with a mean age of 67.3 who had suffered one heart attack showed a greater risk for a second heart attack within one year of the first attack when they had lower HDL (good) cholesterol and smoked.1 Recommend that your patients review the AHA’s tips for lowering cholesterol such as avoiding foods high in cholesterol and saturated fat (eg, fatty red meats, dark-meat poultry with the skin, full-fat dairy products) and foods that contain trans fats (eg, fried foods, baked goods, stick margarines). Fruits and vegetables, whole grains, nuts, and avocados contain no cholesterol, and lean red meats, poultry, and fish, as well as nonfat milk and dairy products, contain low amounts of cholesterol. Soybeans aren’t the only beans that can be beneficial. Last year researchers at Tulane University analyzed 10 randomized clinical trials representing 268 participants and found that subjects treated with a legume diet, or a diet containing dried cooked beans and peas, compared with controls experienced an average decrease in total serum cholesterol of 11.8 mg/dL.4 Dried peas and beans include black beans, black-eyed peas, chickpeas, kidney beans, lentils, lima beans, navy beans, and pinto beans. Sixty-nine percent of those who have a heart attack have high blood pressure. Among those aged 65 and older, 78% of women and 64% of men have high blood pressure. High blood pressure is defined as a systolic blood pressure of 140 mmHg or higher and a diastolic blood pressure of 90 mmHg or higher, according to the AHA. Risk factors for hypertension include obesity, high alcohol intake, low potassium intake, and a high salt intake. According to research published in the January issue of The New England Journal of Medicine, reducing dietary salt by 3 g (1,200 mg of sodium) per day is projected to reduce the annual number of new cases of cardiovascular disease by 60,000 to 120,000 and heart attacks by 54,000 to 99,000. The researchers concluded that older adults would benefit most from this recommendation in terms of cardiovascular disease. The 2005 Dietary Guidelines for Americans recommends consuming less than 2,300 mg (approximately 1 tsp) of sodium per day. Yet the average American consumes nearly 4,000 mg per day. The best way to reduce sodium intake is using fresh herbs and spices rather than salt in cooking and avoiding canned and processed foods as much as possible. Two of the major risk factors for cardiovascular disease are advancing age and obesity.5 Aging is naturally associated with progressive changes in body weight, and this is reflected in the body’s total fat and fat distribution. Explain to your patients that an increase in abdominal fat is associated with an increased risk for heart attack in both men and women.6 One of the AHA’s key recommendations in the recovery phase after a heart attack is weight loss, if needed, and maintaining a healthy body weight (body mass index of 18.5 to 24.9). One way your patients can reach a healthy weight, especially those who have already suffered a heart attack, is to eat more low-calorie, nutrient-rich foods such as fruits and vegetables, whole grains, low-fat or nonfat dairy products, and lean protein foods. The optimal way to prevent a first or subsequent heart attack is to focus on reducing as many risk factors for cardiovascular disease as possible. If this seems overwhelming for your patients, then urge them to concentrate on just a few risks. According to an article published in 2009 by researchers at the Centers for Disease Control and Prevention, having never smoked tobacco, having a body mass index below 30 (the threshold for obesity), exercising for at least 3.5 hours per week, and eating a diet low in meat and rich in whole grains, fruits, and vegetables will lead to an average 78% lower risk of heart disease, as well as cancer and diabetes, regardless of age, gender, or educational attainment. — Carol M. Bareuther, RD, is a St. Thomas, U.S. Virgin Islands-based writer who contributes to a variety of regional, national, and international publications. 1. Sakakura K, Kubo N, Ako J, et al. Clinical features of early recurrent myocardial infarction. Heart Vessels. 2009;24(5):347-351. 2. Rondanelli M, Opizzi A, Monteferrario F. [The biological activity of beta-glucans.] Minerva Med. 2009;100(3):237-245. 3. Torres N, Guevara-Cruz M, Granados J, et al. Reduction of serum lipids by soy protein and soluble fiber is not associated with the ABCG5/G8, apolipoprotein E, and apolipoprotein A1 polymorphisms in a group of hyperlipidemic Mexican subjects. Nutr Res. 2009;29(10):728-735. 4. Bazzano LA, Thompson AM, Tees MT, Nguyen CH, Winham DM. Non-soy legume consumption lowers cholesterol levels: A meta-analysis of randomized controlled trials. Nutr Metab Cardiovasc Dis. 2009 Nov 23;Epub ahead of print. 5. Cruzen C, Colman RJ. Effects of caloric restriction on cardiovascular aging in non-human primates and humans. Clin Geriatr Med. 2009;25(4):733-743. 6. Oliveira A, Rodriquez-Artalejo F, Severo M, Lopes C. Indices of central and peripheral body fat: Association with non-fatal acute myocardial infarction. Int J Obes (Lond). 2010 Jan 12;Epub ahead of print.